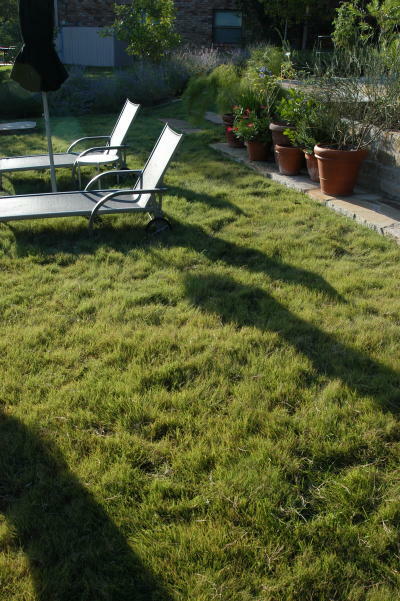 Buffalograss is the best choice for lawns in full sun. It has a soft, beautiful appearance and requires little water and even less fertilization. Some people have tried hard to convince us that the flowers of the male plants are ugly, but the wispy white flags which are often misidentified as seeds are actually quite attractive. If you are hung up on their appearance, sterile female hybrid choices such as ‘Prairie’ are available. They are good but expensive. Whether you buy native or hybrid buffalograss, you’ll be pleased with the results. Mowing Ht: 2” or not at all except for removal of old stubble in the spring. Habit: Warm season low-growing, blue-green foliage, decorative flag-like flower heads that most people think are the seeds on the male plants. Best choice for Texas lawns in full sun. The country’s only native lawn grass has a soft, beautiful appearance and requires little water and even less fertilization. Some people have tried hard to convince us that the flowers of the male plants are unattractive. The wispy white flags which are often misidentified as seeds are actually quite attractive. If you are hung up on their appearance, sterile female choices such as 'Prairie' and ‘609’ are available. They are excellent but expensive. Whether you buy native or hybrid buffalograss, you'll be pleased with the results. Culture: Easy to grow in any soil except wet areas. Plant from seed in spring through September if irrigated. Grows better in heavier soils than in sandy soils. Uses: Lawn grass, large natural areas, low maintenance areas. Problems: Slow to establish, but this is more an adjustment than a problem. Not shade tolerant. 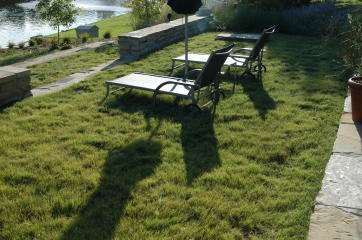 Notes: Our only native lawn grass and the most drought-tolerant and low-maintenance grass of all. Fertilize only once with initial seeding. Do not water too much. Native from Texas to Minnesota and Montana. Suggested seeding rate is 5 lbs. per 1,000 square feet. Native to West Texas. Available As: Seed or sod. Spreads by stolons and seed.